On the afternoon of Super Bowl Sunday, just hours before Philadelphia erupted into victory-fueled joy, about 100 people came together for another kind of gathering. One that has become far more common, with no end in sight. They had come to the William Way LGBT Community Center to mourn Casey Fay Berrian – a fierce, funny woman, deeply troubled yet unexpectedly kind. She loved dancing, Doc Martens boots, her dog Toby Roo, and her many friends. 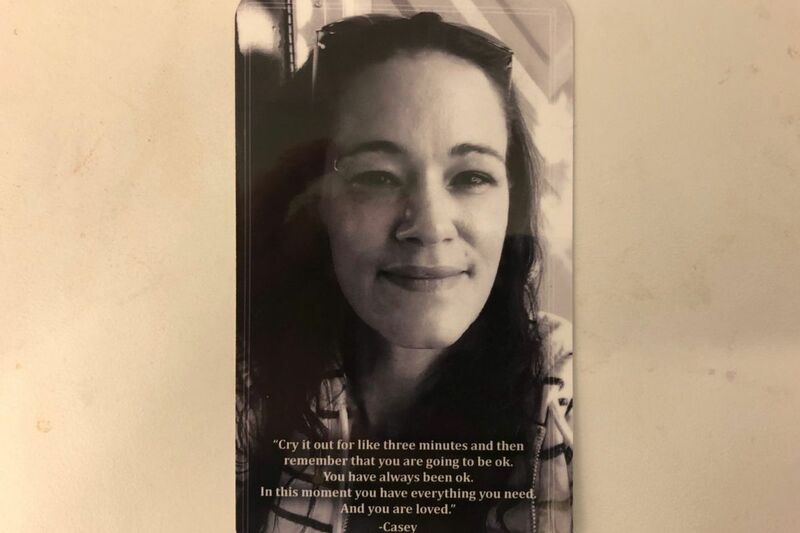 The GoMeFund page for her memorial stated Berrian, who died of a drug overdose on Jan. 8, was a "tough woman who had been fighting a battle with the disease of addiction for a very long time." She was two weeks from her 41st birthday. She was among the first to die this year in an overdose epidemic expected to outstrip 2017, when at least 1,200 people in Philadelphia died. The toxicology report is not yet complete, but Berrian's friends say heroin most likely killed her. Instead of suggesting flowers, the friends who organized her memorial collected donations for Narcan. Their hope is to help Prevention Point, the Kensington needle exchange, finance the opioid overdose-reversal medication. They are still taking donations on the GoMeFund page. "It has become more common," Prevention Point executive director Jose Benitez said of such efforts. "People are doing this in memory of their loved ones." Often, those people aren't blood relations. Many in addiction become estranged from their families because of the pain they have caused. Others come from homes fraught with dysfunction or abuse. So some form families of choice. "The people Casey met and formed close relationships with were her family – her chosen family," said Marcelle, a restaurant worker in recovery. She and others in this article declined to be identified due to privacy and stigma concerns. A collage display of Casey Fay Berrian at her memorial service in the William Way LGBT Community Center. Berrian was a chronic relapser, but she sought out recovery again and again. "Every time she fell, she got back up," said Nik, a nurse and recovery friend. Berrian, for all her exterior toughness, was haunted by demons, some she may have been born with, others possibly rooted in a childhood many described as unsettled and chaotic. "I think Casey, even though she was 40 years old, was a lost child," said Nancy Berrian Bohnsack, 68, Berrian's paternal aunt who lives in Germantown, N.Y. "She wanted to do so much better." Born in New York's Dutchess County, Berrian was very young when her parents split, her aunt said. "Casey had a very confused childhood," said Bohnsack. As a little girl, she was the kind of child who worried how the squirrels would stay warm in the winter. But by the time she was a teenager, her alcohol and drug troubles had already begun, said Bohnsack, who took her in briefly. None of Berrian's family attended her memorial. It wasn't clear whether there will be a family service. Once an aspiring social worker who ended up cleaning houses, Berrian volunteered at hospitals to help others in addiction, especially newcomers. "It's ironic because sometimes she came across as so scary and mean," said Erin, another recovery friend and nurse, "but when it came to a newcomer, she wasn't like that at all." "She was brutally honest," said a former roommate who once stole money from her. Berrian was angry, but was more concerned about helping the friend realize that honesty is part of recovery. "Casey is the one that showed me I have a vicious problem with being honest," said the friend, now two years sober and a legal/medical consultant. Casey Fay Berrian’s version of “Starry Night,” displayed at her memorial service. Berrian also had a creative side. She recited poetry. She painted a version of van Gogh's Starry Night on the inside of a cereal box. And she loved to dance – alone or in a crowd. Her friend Erin performed in the Mummers Parade one year. Berrian showed up. That she had no costume didn't bother her. "She met me on Broad Street, and she danced the whole parade with me as herself," she said. "She had this love of life," said another friend, a lawyer about three decades sober. He saw her last at a community Thanksgiving dinner. She confided she'd relapsed but seemed more worried about a friend who was also using. Less than two months later, she was gone. "Casey didn't do this to us; her addiction did this to her and to us," said the lawyer. "It's the nature of addiction. It's a rapacious beast." Nearly 100 people showed up for Berrian's memorial. Friends spoke; the roommate who once stole from her sang "Amazing Grace"; another friend played the piano. Her spirituality, like much else about her, defied classification. So the service also had a Buddhist reading, a Christian psalm, a Wiccan comfort prayer, and words borrowed from a 19th-century Hasidic rabbi: "God is found wherever He is given entry. God is found in the broken places." "Shake, shake, shake, Señora, shake your body line …"
"Shake, shake, shake, Señora, shake it all the time …"
The friends couldn't help but laugh. If Berrian had been there, they said, she would have been at the head of the line.